Still in geographic transit, the gallery is currently situated in temporary accommodation in Bermondsey, en-route to a permanent home on the South Bank. But this slightly disheveled building successfully continues to extend the nomadic history of Matt’s Gallery project spaces, now in its fifth decade. 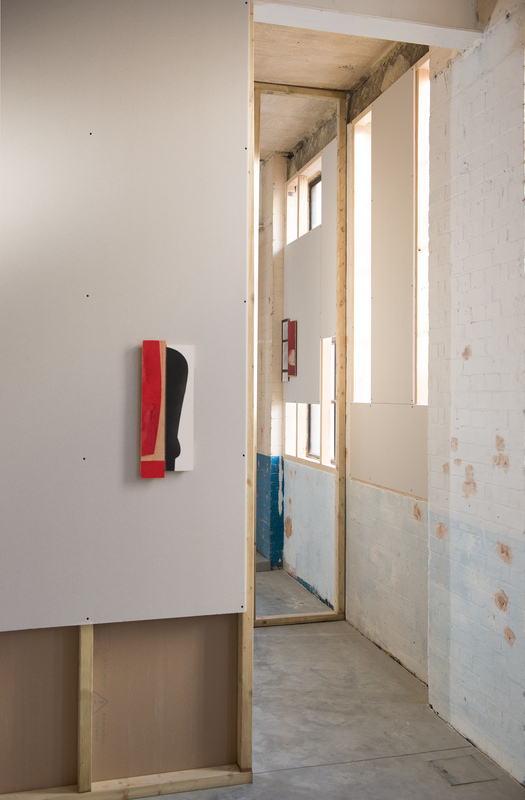 Some interior brick walls retain the glossy colours, stains and scuff marks from previous usage, but for Against Architecture, McKeever, and the Director, Robin Klassnik, have erected additional interior but temporary walls. This, presumably temporary or movable feature, displays and enhances the small collage-like photo-paintings that constitute two series of works: Eagduru and Against Architecture. The title of the exhibition, invoking architecture as the primary subject matter or point of contention, might be misconstrued or misleading – or, better still, thought-provoking. In fact, after seeing the exhibition, ‘With Architecture’ could be a valid title or theme that comes to mind. This is because inadvertently, and organically, this installation has a created an installation. The interior maze of walls that sub-divides the otherwise large room constitutes a provisional environment for the artworks. There is some sense of building in progress, as if the builders had been laid off for a month or so to accommodate the show. A visitor might understandably regard the overall presentation as a fully-fledged intervention, whereby all aspects of the show, not just the artwork on the walls, constituted an expanded theme that conjoined image and environment. 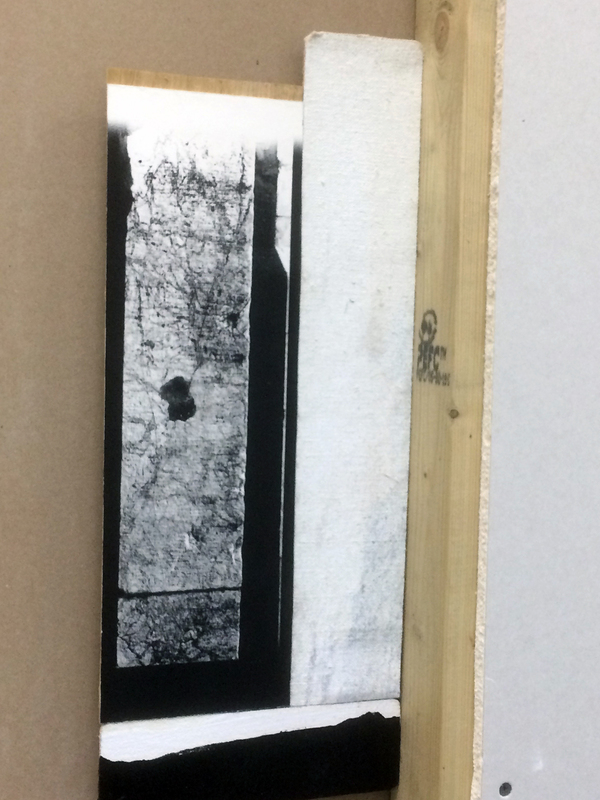 But whilst this is feasible, McKeever’s panels remain autonomous works of art, albeit, as elements from the series that is typical of his working process. 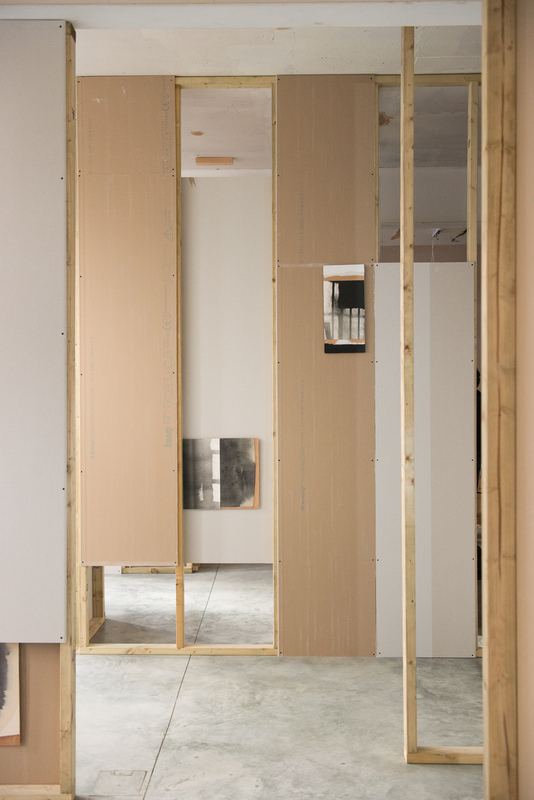 On entering the gallery, the first wall encountered is purposely bare (as is the final, freshly plastered wall), but a choice of thresholds invites the inquisitive visitor to explore a semi-open labyrinth of sturdy but half-built walls of timber and plaster board. The general character of the sub-divided space mixes a series of corridors, cupboard-like voids and interstices – the spaces between that are generally forgotten. This characteristic presents and blends the artworks into the gallery space successfully and brings investigation into play, augmenting a solely visual encounter. 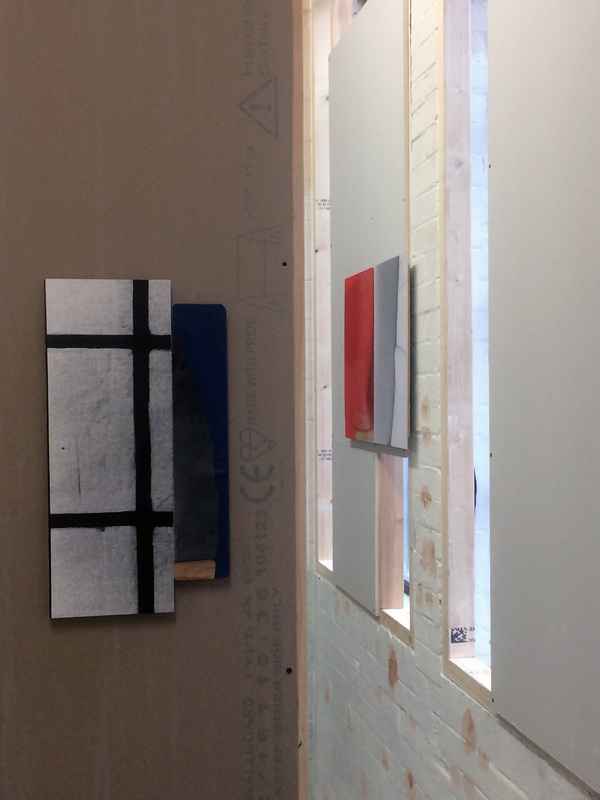 Distributed at various heights, and with adequate space in between, the plyboard panels that form the supports of McKeever’s works have been overlaid with cropped black and white photographs, pieces of painted canvas and generally thin coats of monochromatic paint. 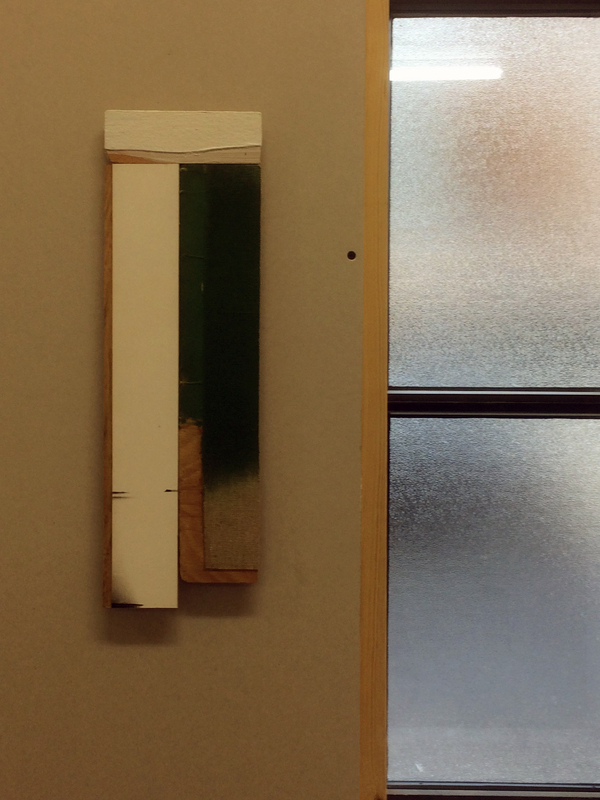 McKeever’s palette consists of red, blue, green, black and white, and the colours are, in effect, forms in themselves and are not referential. The most obvious figurative visual references to the external world are seen in the photographs that record silhouettes and shadow forms falling onto walls and furniture, through a curtain or blind, or showing the grid form of a window frame. As photographic segments there is a degree of implicit abstraction. The objects and their shadows appear to exclusively reference the interior of the artist’s home, Hartgrove, which suggests interiority and intimacy of a private space. These fragmentary black and white photographs also offer a record of ambient light conditions, recorded during daylight hours, perhaps constituting a meditation on apparent stillness, but with time progressing almost unnoticed. Followers of McKeever’s career will be aware that philosophical, and sometimes spiritual, references reside in the background context of his work. But, thankfully, the actual artworks do not rely on a textual exegesis to respond to them. Possibly, there is a reference in these two series of works to Gaston Bachelard’s felicitous domestic space; where the topography is not only formed of the homely architecture and the furniture within; but is blessed by the contrasting light conditions – and the lived duration of time, that encompasses past, present and future. These conditions are impermanent – but the static image and the materiality of the art form contradict this phenomenon. More prosaically, McKeever’s photographs show us that the everyday (which might be peripheral, yet contingent, to our seeing and attention) is actually very interesting – if only we took the time to ponder for extended periods of time. Therefore, we have to make time; and make an effort. The paradox is that the endeavor is effortless, for it is a matter of will, of choice. Likewise, the juxtaposed abstract low-relief paint and canvas-covered panels maintain the notion of finding engagement in the simple and straightforward reduced forms that are autonomous rather than figurative. 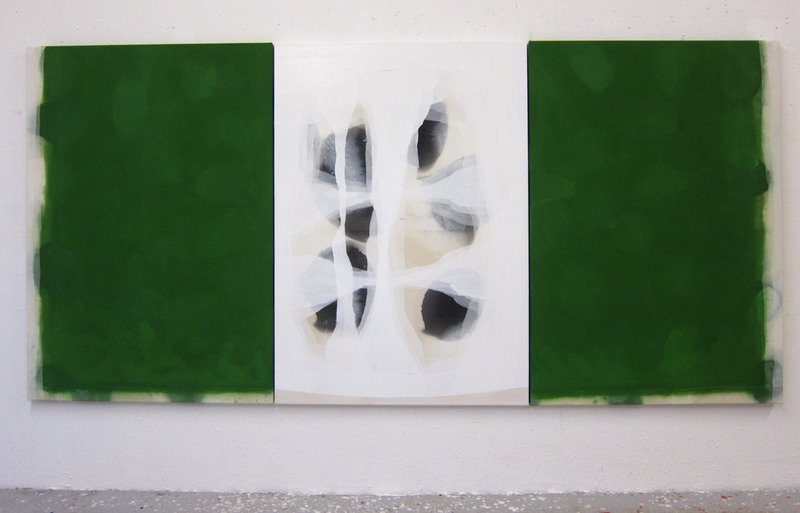 From a subjective, phenomenological perspective, McKeever’s collage-paintings are bodies of a sort: absorbers and reflectors of the artist’s (and, by extension, the viewer’s) visual and physical confrontation – offering a dynamic interplay between light and dark, materiality and perception. Typically, we stand in front of, look at, and think with, an image. (In this instance, a combination of the hand made and the mechanical). There are undeniable and unavoidable visual echoes with notions of the interior – which is certainly not exclusively domestic. The common characteristics of the panels are essentially structural and planar. Through the photographic, collage and paint content, the interior space of the compositions consists of contrasting vertical and horizontal shapes; flat planes, curved edges, including stained or overpainted canvas (which in fact are segments of abandoned, larger, paintings). The scale is ergonomically conducive to an encounter that is not overwhelming. The panels are small enough to be hand held, and suggest portals onto spaces and forms that we can relate to: small voids, corners, edges and walls; a stairwell, a curtain, a sense of territory sub-divided by shape and light – or just pure form/space without the necessity of a figurative reference. In fact, the term ‘éagduru’ literally means ‘eye-door/window’ in old English (Anglo-Saxon) and so the idea of a physical connection is teasingly proposed. Against Architecture offers an unexpected insight into McKeever’s range of work, as his numerous painting series have generally been interspersed with printmaking or gouache on paper studies – although the inclusion of the photographic print was a significant feature of his work in his early career. But the tradition of painting is an essential practice for McKeever and his typically large canvases appear to contrast with most forms of figurative/mimetic recording. But an embodied character, with a self-contained mode of abstraction, seems paramount to his long-term painting project. It has previously been in relation to landscape, but increasingly to formations of light and space, and a burgeoning physical sense of the architecture of the body, that his investigation has engaged with. So the terms abstract, or abstraction, might be contended, particularly as McKeever has described his work as ‘post-abstract figuration’. (See – Between Space and Time: An interview between Ian McKeever and Jill Lloyd’ ) – which might present a contentious subject for participants in the AbCrit forum. In the preceding week of the private view, Ian McKeever kindly agreed to engage in an exchange of questions by email. GH – Visitors to Against Architecture at Matt’s gallery, who have not seen the pre-show photographs, might be expecting to see some of your larger paintings. IM -The Matt’s Gallery exhibition is an unusual one for me. I’m showing the very small photo/painted panels, some of which you may have seen on a shelf when you visited the studio. We have made a loose labyrinth of walls to take them, which somehow, now up, seems to become an extension of the works, moving towards a ‘gesamtkunstwerk’. I’m still assimilating what it all means for me. GH – The image from the Matt’s Gallery email invitation suggests an installation of sorts. So I assume that the viewer will walk towards, alongside, up to and away from each panel. The allusion to the labyrinth makes sense – even if on a superficial level for now. A physical rather than a visual (or perspectival) experience of space has always permeated your work; not just for you as the maker, but for the viewer on an intellectual and emotional level (at least that’s my experience). So visitors might feel that they are literally ‘in’ this presentation at the gallery in a contemporary Installation-type sense. The Eagduru/Against Architecture panels seem to invoke (and evoke) sculptural constructs, whilst retaining an implicit Cubist flatness – am I on the right track here? IM – I’ve never thought of Cubism as being particularly about the flattening of space. The history of painting has always been a play between the painting plane versus the pictorial. One need only think of Piero della Francesca. Some painters tend to ‘see’ more rounded, more physically than others, just as some sculptors appear to be pushing back towards the two-dimensional. These aspects can be one of the qualities in an artist’s position, which inflects the work, makes the work present yet not fully realised, in a good way. I proceed in working by feeling, sensing the space both around and potentially in the painting, not by visualising a space pictorially. Perhaps the Eagduru and Against Architecture panels are picking up on this, extending this zone of in and around the painting, so to speak. GH – My initial reaction was in response to the integration of the panels/artwork with the constructed/deconstructed walls and the underlying structure (the floor and ceiling too). 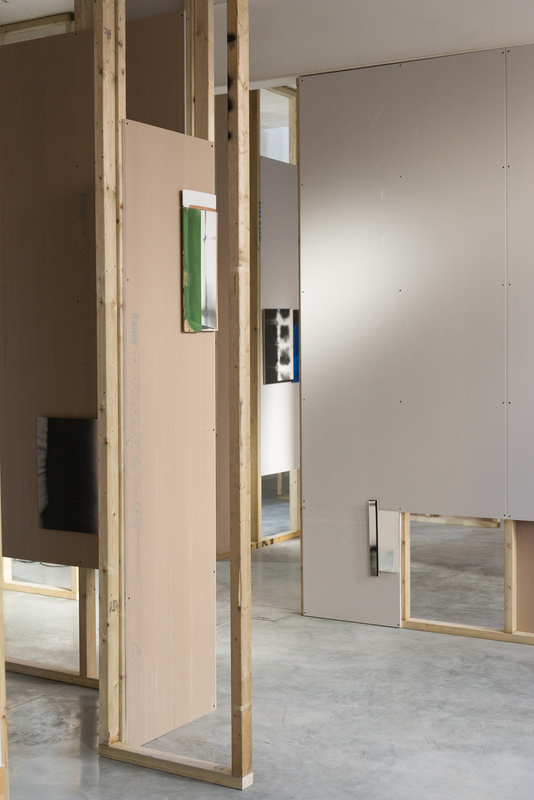 Maybe the exhibition space will feel very ‘installation-like’ – which perhaps echoes the ‘Painting for a Hole in the Ground’ (1976) as the artwork is integrated into ‘the real’. But of course, seeing the exhibition through photographs (or your own thinking, as you said earlier) is nowhere near the actual experience of seeing/experiencing the work for oneself. GH – My earlier reference to ‘Cubist flatness’ was too off the cuff; I was thinking of planes of two-dimensionality. I have just looked again at Piero della Francesca’s wonderful ‘Baptism of Christ’ on the National Gallery website and even in digital reproduction the visual qualities create a subtle conundrum – that “play between the painting plane versus the pictorial” that you mentioned earlier. I find this image believable as a representation of a void/space filled with the landscape features and the figures. But then there is also the sense of what I might ingenuously reference as cardboard cutouts, as the modeling is so shallow and each feature (the figures, trees, clouds and dove) seems complete in itself. But I sense the space behind and between the figures (so it’s not like a jig-saw puzzle where parts simply fit together) and a pictorial sensibility induces an emotion of spatial extensions. The mind’s eye can weave between the forms in the imagination. IM – The state of figures appearing connected by a common act, yet disconnected on other levels is something one sees in classical Greek friezes. It runs through the narrative in the Parthenon frieze sections in the British Museum. The figures connected formally, running in parallel so to speak, but distanced, abstracted from each other, as if each is in its own world. It is a form of abstraction, imbuing the work with a stillness, even in scenes of hectic battle. One has this same quality in Piero della Francesca’s paintings, the figures appear almost to be fixed in stone, immobile. Thinking about it one can also see this aura of detachment in some compositions of William Blake. His figures are often equally enigmatic, there but not there. GH – I had not thought about Blake’s figures in this way, as the dramatic narrative is so powerful. There’s a tangible weightiness in his figures for sure, which is heavy or light, as if gravity or some other invisible power was at play. This quality of stillness is interesting. Stillness might suggest timelessness (which might be an instant or forever) and movement could be quantified into units of duration, which contains a contradiction of sorts as duration has a beginning and an end. Either way, there’s an inherent dialectic to be experienced in engaging with painting. I’m thinking here of an artist such as Georgia O’Keeffe, who I believe you admire. Her New Mexico work seems both transcendental but utterly connected with her immediate environment – especially in terms of light. But her light and colour is somehow enigmatic too – which confers an abstract glaze or filter over the figurative content of her work. If it’s not too much of a contradiction, there’s a dramatic stillness in O’Keeffe’s work. If I could reference the recent Abstract Expressionism exhibition at the Royal Academy, particularly as the AbCrit community had an especial interest in the show, many of the works presented could have been viewed with notions of stillness or movement in mind. For example, Newman, Still and Rothko’s paintings suggest an inherent stillness or monumentality – whereas Pollock, Kline and De Kooning’s images have a more overt dynamism due to the gestural characteristics of their application of paint. I don’t mean this in an absolute way; for example, in Rothko’s work there is a sense of depth, moving the eye in and out, that also creates a sense of movement. IM – Can I come at this in another way? I tend to think that stillness, like the sublime, tends to get lost as soon as it is spoken about. The ‘still photograph’, one never hears that expression used now, it somehow does not fit the digital mindset. All the photographs I take, including those in the Eagduru and Against Architecture work are analog black and white photographs. The difference between the moment of the photograph and the more extended time frame of the painted surface interests me. In my early paintings I worked with gestural mark making, but found as time went on I felt the need to take that heat out of the paintings, arrive at the painting surface more uniformly across the whole surface. Good photographs have for me a similar quality; the moment they hold is total, an aggregate rather than incident. GH – You must be pleased with the show at Matt’s Gallery. The installation of the works with the interior architecture of the gallery created a homogenous environment: but with due focus on the artwork, without the structural interior dominating. The Against Architecture (and Eagduru) panels took on a sense of the interior still life, as the architectonic ‘imagery’ of the panels resonated with the surroundings in an otherwise abstract-type manifestation of forms. Is this an example of the ‘post-abstract figuration’ that you have discussed before? IM – Yes, I am pleased with how the Matt’s Gallery exhibition is looking. I like the dialogue between the walls and the pieces, it’s very open ended, suggesting rather than declaring. As to your question concerning ‘post-figurative abstraction’, in relationship to the installation, I think I would need to think more about it, let the exhibition sink in a little. I used the expression ‘post abstract figuration’ more specifically in relationship to painting. Our usual understanding of abstraction in painting is that one goes from the figurative to the abstract. That one starts with the concrete object, a subject and abstraction follows. This is essentially the position of the generation of painters that preceded mine, John Hoyland, etc. A blind faith in abstraction. My formative years as an artist were the 1970s, when conceptualism was to the fore. The climate was suspicious of painting, certainly gestural painting. 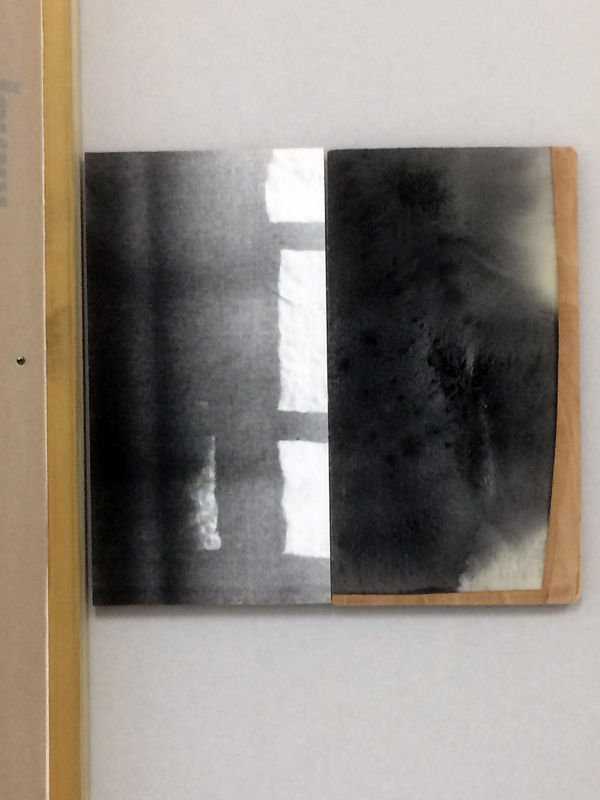 My own interest in mark making, in painting, was informed by conceptualism. I tried to speak about this in the pamphlet I wrote to accompany my very first exhibition with Matt’s Gallery, ‘Black and White and how to paint with a Hammer’. My thinking and understanding is that in painting one begins abstract, with a welter of abstractions, be they formal, conceptual, emotional, sensory, psychological and then pushes towards the painting, which by definition becomes figured. In that it finds a state in the world, no matter how liminal, which never the less alludes back to the human condition as a sensate being in the world. GH – The photographic and painterly imagery – presented in the physicality of the panel supports and the openly constructed walls in the Matt’s Gallery show – certainly have this sense of the figurative and the abstract co-existing. I would imagine that any of the individual panels might take on a different character if viewed individually in a typical white cube gallery space – or in a domestic setting, such as Hartgrove. Or perhaps hung alongside one of the Russian Icons that you collect. In whatever setting or configuration, there is a possibility of a conversation of sorts between the artwork, the surrounding space and the viewer. And that conversation could be mute. IM – I think all good art, and certainly all good painting, never fully lets you in – it has something of that quality of mute separation felt between oneself, a wall of plate glass, and what lies beyond.